800 farmers at the presentation of Grassland AGRO, with Teagasc. widespread use of grass in cattle feed (milk, meat, and goats). 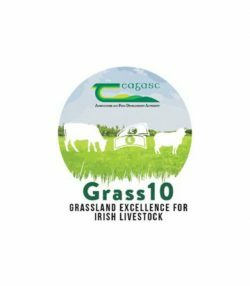 The objectives of the programme are to help Irish farmers achieve 10 tonnes of utilised grass dry matter per hectare per year, and 10 pasture grazings per year . Within the programme, a Grassland Farmer of the Year Competition is being held each year. The overall winner of the 2017 campaign was the O’Donnell Farm in Co. Tipperary. To celebrate this victory, an Farm Open Day was held on the O’Donnell farm on Wednesday, April 18. Grassland AGRO (TIMAC AGRO Ireland), a lead partner of the Grass 10 programme and specialists in pasture fertilisation, participated in this day by cofacilitating the fertiliser and soil fertility management workshop. Dr. Stan LALOR, Head of Specialty Business of Grassland AGRO, spoke to the 800 farm visitors to explain good fertilisation practices and bring Grassland AGRO’s expertise to the forefront of successful and profitable fertilisation programs.